To sell your honey at a farmers market or a flea market you need a gimic to get the people to stop and look. We found that once someone stops, looks and asks a question, we can sell something about 60% of the time. One of the better ways to get your potential customer’s attention is with an observation hive. The following observation hive is as uncomplicated as I could make it and still have some flair. To keep the construction simple a feeding station was obmitted. This means that you will have to limit the time a set of bees remain in the hive. First we’ll make the frame that has a fixed glass or plastic panel and then we’ll add a top and base that adds stability to the unit. Finally we’ll build the door that allows easy access to the bees. Please note that this observation hive has no allowance for feeding the bees. It is strictly for short term use. Step 1: The first cut that has to be made is the ⅜” deep groove ½” from the edge of an 8’ board. This groove will eventually hold the fixed glass in place. Make this cut first while the selected board is still in one length. This ensures that the groove will match around the entire observation hive. The width of the groove is dependent on the thickness of the glass or plastic that you are using. See the drawing Detail ‘A” for and end view of the board. Hint: Slide your glass or plastic along the entire length of the groove before performing the next step. This is to make sure you will be able to install the glass once the box is complete. Step 2: Rip cut the groove from the long board. This piece will be used to make the top, bottom and sides (parts 1 and parts 2). The width of this piece is dependent on the thickness of the glass or plastic you are using. Calculate the width of this piece by adding the ½” outside part of the groove plus the groove width plus 1⅝”. Again see the drawing Detail “A”. Step 3: Cut the top cover (part 4) and base (part 5). Hint: Now is the time to sand the pieces you have just cut. Once they are assembled, they are harder to sand. Step 4: Drill 1” vent holes in the sides (parts 2). After drilling the holes, staple window screen to the inside to prevent the bees from escaping. Hint: To make a neat hole, drill from one side until the point of the drill emerges on the other side. Then turn the piece over and finish the hole from the other side. Step 5: Cut the frame rests (parts 3) and then glue them to the sides. Be careful you don’t cover the groove that the glass will slip into. See Detail “B” for an enlarged view of a frame rest. Step 6: Glue and nail the base (part 5) and the bottom (part 1) together. It is a little tricky to get the bottom positioned on the base. Centering the bottom left and right is simply making sure the same amount of distance is on each side. The front to back positioning of the bottom needs to take into account the access door which will not be built until a later step. To accomplish this, temporally tack a ¾” piece or wood on to the non-grooved edge of the bottom and then use the new width to position the board. Remove the temporary piece of wood when you are finished. Step 7: Repeat the same operation to assemble the top that you did for assembling the bottom (previous step). Step 8: Drill the vent holes in the assembled top. Then use the window screen trick to keep the bees from causing a panic at the next farmers market. Step 9: Use screws to assemble the top, bottom and sides into a square while test fitting the glass. Use screws so the unit can be taken apart later and the glass inserted. Note: The glass is not installed at this time so you can paint or varnish the observation hive without getting paint on it. Step 10: Cut the stabilizing legs (parts 6) and attach them to the bottom of the unit. Do not cover any screws you have used so far. You may want to disassemble the unit in the future without removing the legs. Step 11: Cut the door top, bottom and sides (parts 7 and parts 8) from your lumber. Step 12: Explanation: The glass is recessed on the inside of the door. This keeps the glass close to the frames of bees and reduces the amount of wax and propolis buildup on the glass. Lay the door rim (parts 7 and 8) out on a flat surface with the good side facing down. Then center your door glass over the door rim and mark the edges of the glass. Use these markings to cut the recess into the door pieces. Step 13: Glue the door frame together. Make sure the joints are tight and the door is square. Hint: Use a framing helper to keep the door in alignment until the glue dries. Step 14: Paint or varnish the unit at this time. A couple coats of polyurethane varnish will make the cleaning of the unit a lot easier. Step 15: Mount the glass in the door using silicone seal and let it dry. The glass and silicone will hold the door frame rigid. Hint: Use masking or painters tape to cover the wood before adding the silicone seal. Removal of the tape will clean the excess sealant off the door. Hint: Be sure the inside of the glass is even with the inside of the door. Step 16: Mount the door to the hive using the hinges and the hasps. Step 17: Remove the top and add the handle (part 13). Then slide the glass into the slots on the side opposite the door and replace the top. Step 18: For safety, add a Phillips head screw that goes through the top into the door frame. After you load the bees screw the top to the door. You never know what someone will try to do and 1000 bees loose at a flea market or demonstration will guarantee that you will never be invited back. Congratulations! The observation hive is complete. Now all you have to do is fill it with your gentle bees. Add a couple frames with bees and some capped brood and you have a fantastic conversation piece and a lead in to a lot of sales. For transportation cover the observation hive with a dark cloth. Do not restrict the ventilation holes. 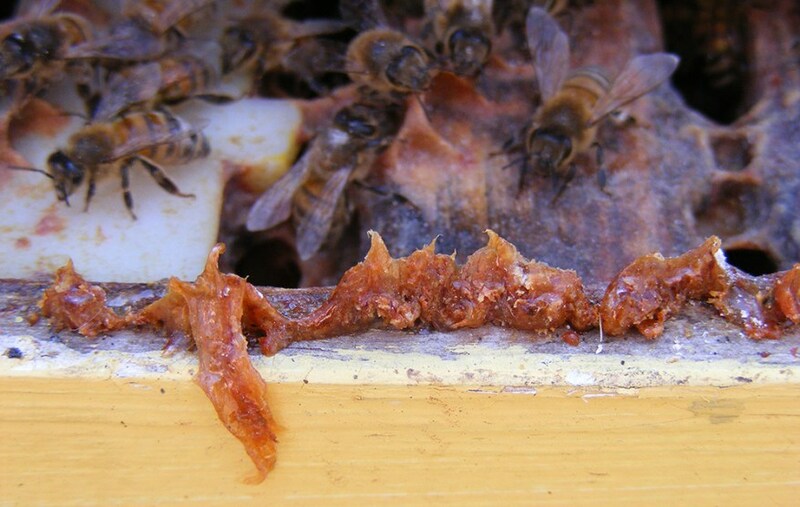 In an emergency honey and/or water can be added to the hive through the top ventilation holes. Do not let the observation hive sit in the sun. The glass, bees and sun can be a deadly combination. You should also lock the hive door so it can’t be opened when you take it to the market. With my luck I know some smart kid would open the door so he could pet the bees. You can change the size of this observation hive to hold two deeps or one deep and one medium very easily by changing the length of the sides and repositioning the frame rests. If you use a deep or two you should also consider adding a couple more air vents.